Closely observed drawings of potatoes which describe three varieties of this vegetable, made during the winter months when their sprouts naturally grow towards the light. The artist has taken three or four potatoes and placed them in lines in order to look closely at their forms and colours. She hopes to convey some of her fascination and respect for the vegetable world through her keen observation of their habits. 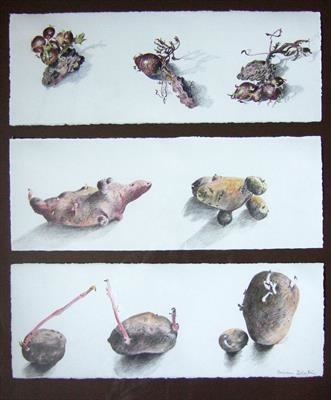 The top drawing shows seed potatoes that have been languishing in a shed for a season - tiny potatoes can be seen growing from last years shoots.